Denmark’s most successful golfer, Thomas Bjorn’s stellar career has included 15 wins and 94 top ten finishes to date on the European Tour. Twice runner-up in The Open Championship, and a three-time Ryder Cup player – always on the winning side – he was appointed Chairman of the European Tour’s Tournament Committee in 2007. He is a four-time Vice-Captain to the European Ryder Cup team, picked for the role by winning captains Bernhard Langer (2004), Colin Montgomerie (2010) and José-María Olazábal (2012), as well as by great friend Darren Clarke for the 2016 match at Hazeltine, Minnesota. The 46-year old Dane will represent the golf club, which is located near Barnet in Hertfordshire, as momentum builds towards the 2018 Ryder Cup, due to be held from 28-30 September 2018 at Le Golf National close to Paris, France. Speaking at The Shire London, Thomas Bjorn said: “I am very honoured to have been appointed Honorary Captain and to become an ambassador for The Shire London. During his two-year Honorary Captaincy at The Shire London, Thomas Bjorn will each year host a new event, The Thomas Bjorn Trophy, the first of which will take place in September 2017. He will also use the club’s practice facilities and gym, as well as playing at the club’s spectacular 7,028 yard Ballesteros Masters Course, the UK’s only golf course fully designed by Severiano Ballesteros. The Shire London, which has no traditional committees or club captains, has become one of the capital city’s most popular golfing venues in the ten years since it opened. 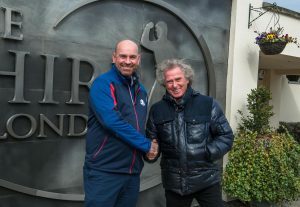 “We could not be more proud that Thomas Bjorn is joining us here at The Shire London to make it his home club” said The Shire London’s Tony Menai-Davis. “It is a huge thrill for all of us connected with the club that such a successful and influential figure from world golf will be representing us for the next two years, and we look forward to seeing him around the club. In 2018 Thomas Bjorn will become the first Dane, and the first Scandinavian to lead Europe when it returns to mainland Europe for the second time at Le Golf National. The Ryder Cup’s first appearance in mainland Europe also marked Bjørn’s debut as a player in the event, at Valderrama in Spain in 1997, where he went unbeaten for the weekend as Europe secured a thrilling victory. His Team Captain that year was the charismatic Severiano Ballesteros, designer of the Ballesteros Masters Course at The Shire London. “It means a lot to me that my hero Seve designed the golf course at The Shire London” he said. The Shire London will shortly announce details of The Thomas Bjorn Trophy 2017, which the Dane will personally host, and which will be open to all golfers. Discover more about The Shire London at www.theshirelondon.com, and about its sister venue The West London Golf Centre at www.westlondongolfcentre.com. Share the post "Thomas Bjorn made Honorary Captain of The Shire…"